The obituary page of The New York Times is a celebration of extraordinary lives. This groundbreaking package includes 300+ obits of the most important and fascinating obituaries the Times has ever published. The obituary page is the section many readers first turn to not only see who died, but to read some of the most inspiring, insightful, often funny, and elegantly written stories celebrating the lives of the men and women who have influenced on our world. 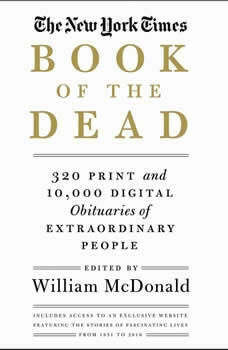 William McDonald, The Times' obituary editor who was recently featured in the award-winning documentary Obit, selected 320 of the most important and influential obits from the newspaper's archives. In chapters like "Stage and Screen," "Titans of Business," "The Notorious," "Scientists and Healers," "Athletes," and "American Leaders," the entries include a wide variety of newsmakers from the last century and a half, including Annie Oakley, Theodore Roosevelt, Joseph Stalin, Marilyn Monroe, Coco Chanel, Malcolm X, Jackie Robinson and Prince.